Need more information about booking Home 7285959 ? LUXURY VILLA with 5 bedrooms, each with its own bathroom and WC - Comprising HEATED POOL (Indispensable to bathe all year) NO NOT OVERLOOKED - With home delivery staff for cleaning and cooking - several terraces to isolate themselves to read or do bronzing. My name Jakline, I'm Brittany, and thus screw MIRLEFT for 10 years with my retired friend, FRANCIS, the Basque Country. We discovered this place a mixed between Brittany and the Basque Country with its beautiful beaches and rocks. We discovered this little village and savor it everyday authentic Berber side of Morocco while living in a villa with European comfort, adjoining villa that we rent, called "LA VILLA DES ARCADES". We tried to put all our heart for the construction of this villa in a Moroccan atmosphere of prestige. 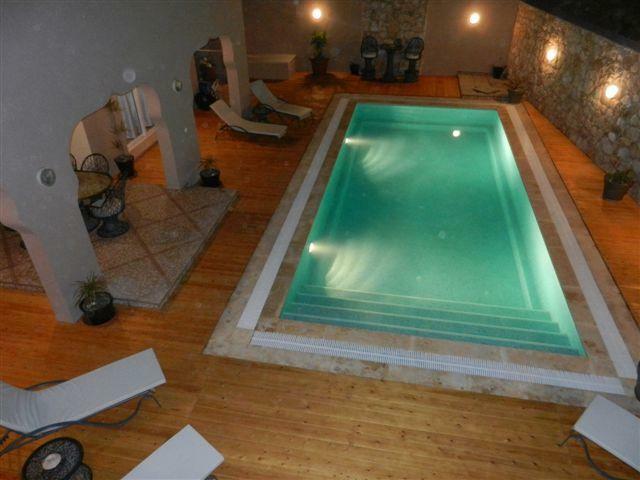 This villa has 5 bedrooms each with bathroom and toilet. All rooms are equipped with hairdryer. There are 2 bedrooms on the ground floor that overlook the pool, and 3 other bedrooms upstairs with 2 large terraces with a sea view for relaxing and bronzing in peace. Everyone can find tranquility given the relatively large volumes. From the living room you can contemplate a beautiful exotic garden with local species. The name of the Villa, called "LES ARCADES" comes from the fact of its arcades facing the pool. Dining area, part shade and part sun, facing the pool and allows you to take meals. The pool is heated all year. It has no vis-à-vis. You also have a small garden area, where you can isolate yourself to read a good novel. The sea is 50m from the villa. You can walk down to a small beach located at 300m. You will not miss dishes in this villa: Pressure Cooker, toaster, fridge-freezer large model, cook-stove large model, microwave, tagines all sizes. The villa is located 50 m from the sea and 800 meters from the village of Mirleft. The nearest airport is at 130 Kms of Agadir. One of Marrakech is 400 kms. We have our gardener, LAHCEN, which handles the pool and garden. We organize working hours in order not to disturb and to respect privacy. We also have a young woman who provides cooking and cleaning six days on 7. You choose your menu with her, and she tells you the groceries you do accordingly. She prepares meals from breakfast to dinner in the evening. Are included in the price, LAHCEN service and this girl. I remind you that we are in the sea, and here the fishermen come to offer you directly to the villa, fish freshly caught and still wriggling. In this villa, it's as if you were in a 5 star hotel, with the advantage of being the only guests, with house only to your service staff, in a quite unique luxury with heated pool, and no overlooked. You can get in touch with Jakline (the owner) through the contact form on this page. Send Jakline (the owner) an email through the contact form on this page. Alternatively, if there’s a phone number on this page, you can call them. How do I contact Jakline (the owner)? If you’ve already booked, go to Manage your holiday booking to view Jakline the owner's contact details or send them a message. Or send Jakline (the owner) an enquiry through the Contact the owner/manager form if you’d like a quote or more info first. When you pay online through the Book your stay form, a booking request is sent to Jakline (the owner). You’ll find out within 24 hours whether they’ve accepted - no money will leave your account before then. You can also request a quote from Jakline (the owner) through the contact form. The owner will email you the total cost for your dates and a link to book and pay online. Use the Book your stay form to pay provisionally online. You can pay by credit/debit card or PayPal. Jakline (the owner) will have 24 hours to accept the booking and no money will leave your account before then. Why can't I call Jakline (the owner) before booking? You’ll need to contact Jakline (the owner) to do this. Send them a message in Manage your holiday booking or through the contact form on this page. You can request to change the dates or number of people on your booking via the Manage your holiday booking page. To change your holiday dates use the Edit booking button. If you need to change the number of guests staying then send Jakline (the owner) a message. If Jakline (the owner) agrees, they’ll send you a revised quote outlining the changes. You can review and accept/decline this from the Manage your holiday booking page. You’ll have 48 hours to take action before the revised quote expires.